Orange site No. HER 0093; 20m galv. steel tapering lattice mast, 4 sector ant; pale grey cabins; 2m netting on galv. steel posts. No planting. Comments: Sited in mature woodland, top 3m protrudes out of the tree canopy and despoils important views of the north side of a wooded valley. 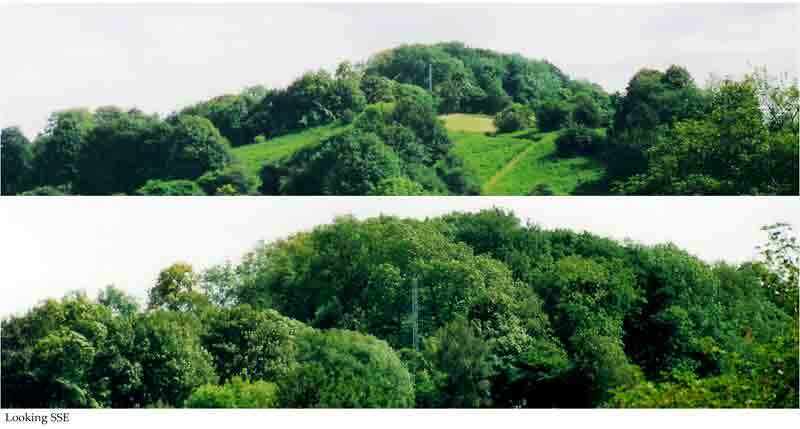 Urgent Amelioration needed: Minimum paint mast, cabins matt BS 12B25; ideally demolish mast and replace with wooden poles which are within the tree canopy but which take advantage of the steep slope of the side of the valley. Comments: Tall intrusive mast on high ground emerging from trees, visible from miles around. Urgent Amelioration Needed: Demolish and start again using tree mounted and wood pole mounted ant. Comments: In the centre of Mitcheldean, soon lost into the urban fabric. Very close to homes and workplaces. 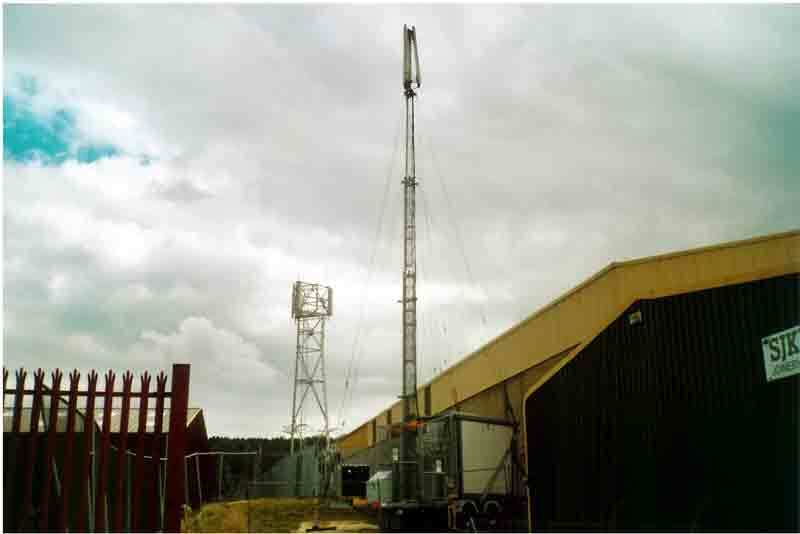 Large radio and multi-operator site; 46m parallel sided galv steel lattice tower carrying many large dish ant. Large compound with buildings and equipment cabins; 4m fencing; set within mature woodland. Comments: The very worst type of site. Large, ugly, highly intrusive masts emerging from high woodland horizon and dominating good country views for miles around. URGENT WORK NEEDED: Demolish and replace using wood poles sited within the tree canopy and off the summit. Large dishes can be given line of sight by making a clearing within woodland rather than placing them higher than the tree canopy. Vodafone site No. - ; 15m tapering galv. steel mast; 2 co-linear ant; black equipment cabin. Comments: Relatively minimal installation soon lost in urban fabric. Some would find it too close to housing. Improvements: Reduce height of pole and paint it and cabin a buff stone colour. Crown Castle International site No.-; 15m tapering four section galv. steel pole; 2 sector ant; 1 dish ant; 2m green netting on galv. steel posts; grey/green equipment cabin. Orange site No.-; 15m tapering glav.steel lattice mast; 6 sector ant; 2 dish ant; 2m green netting on concrete posts; grey equipment cabins. Comments: Both stations are very close, less than 50m, to local housing and this is good enough reason to remove them to another location. Curious visual link between masts and football ground floodlighting on tapering steel posts of similar height. Orange site No.-; 15m tapering glav.steel lattice mast; 6 sector ant; 2 dish ant; 2m palisade fencing; grey equipment cabins. Vodafone temporary mast on trailer site No.-; 15m extending galv. steel lattice mast; 3 sector ant. Comments: Sited in an industrial estate these are soon lost in the urban fabric. Too close to work places, less than 20m. ntl site No. 11054, originally a broadcast only site – now a multi-operator site with Vodafone, Orange and Tetra ant; 25m galv. steel tapering lattice tower, 3 sector ant; 2 co-linear ant; 3 tetra ant. broadcast ant; 3 large equipment cabins – 2 grey and one olive green; 3m. black netting fencing on rusty steel posts; existing 3m. shrubbery on two sides. Comments: The very worst type of site. 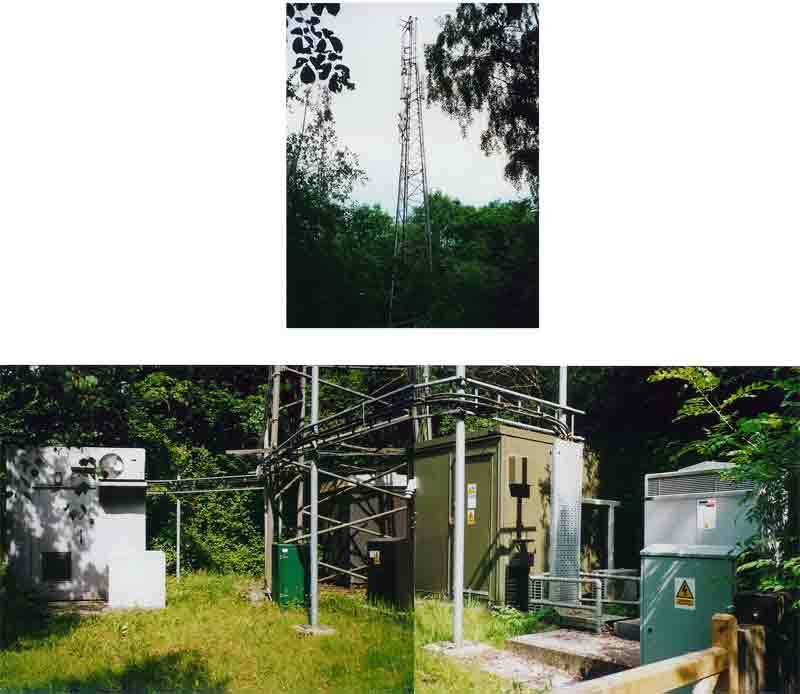 Highly intrusive dominating mish-mash of ill-mounted antennae on tall mast sited on the summit of high woodland; intrudes into important views and vistas for miles around including views from the Wye Valley AONB, also close to, and dominating, local housing. Local campaign group has received insulting and dismissive behaviour both from operators and local council. Such a mast would not be allowed now and has come about through the long control of the site by Crown Castle, initially for broadcast purposes, with subsequent ad hoc additions of mobile phone and tetra antennae. Sites such as these (and they are numerous now) are supremely damaging to the historic landscape heritage of the British Isles. URGENT WORK NEEDED: Demolish immediately, ideally attach ant. to living trees or replace with 2 or 3 carefully sited wooden pole masts which are off the summit and do not rise above the tree canopy. Orange site No. – erected summer 2002 in the face of considerable local opposition. 15m steel pole mast painted green with gloss finish; 2 sector ant; 2m steel palisade fence, grey cabins; no planting. Comments: A relatively benign siting from a visual point of view although local opinion believes it is too close to housing. The mast is concealed from many viewpoints and when it is visible, has a backdrop of trees. The benefit of the green finish of the mast and compound fence from a camouflage point of view is almost entirely dissipated by a). the paint is gloss finish and catches the sun and b). the pale grey antennae which ensure the high visibility of the whole against the wooded backdrop. Urgent amelioration needed: Simple painting of the antennae the same colour as the mast would make a considerable difference. Ideal: Demolish and replace with wood pole or use tree attached antennae. Crown Castle International multi-operator site No.1492238; Mmo2 Airwave site No. GL0 056; 3 site No-. ; T-mobile site no.92238; Vodafone site No. 40397; 20m parallel sided galv. Steel lattice mast; 10 sector ant. ; 2 dishes; Tetra array; 3 green and 5 pale grey cabins, 2m netting on galv. Steel posts; new access track scars field; no planting, existing trees provide useful backdrop. Comments: Tall intrusive mast with a confusion of antennae spoiling many views. Site has grown significantly over last 5 years. Urgent Amelioration Needed: Ideally demolish mast and replace with wood pole masts and/or tree attached ant. Minimum paint mast, ant., cabins olive green and plant semi-mature shrubbery around compound. Orange site No. - ; original mast 15m tapering galv. steel lattice sited in 1995 with 6 sector ant;1 dish ant; 2 pale grey equipment cabins; 2m netting on concrete posts. A 5m vertical extension was added in 2002 with 3 more sector ant and 1 dish ant. Comments: Tall, ugly intrusive mast in open countryside, visible from A48, local footpaths and from afar. Urgent Amelioration needed: Demolish mast and replace with wood pole(s), plant shrubs around compound. The ubiquitous standard Orange mast design makes no pretence whatever to elegance or responsiveness to rural surroundings, or any other surroundings (nor do many others). It is an engineer’s answer to the need to hold the antennae aloft. It is ugly and has an unmistakeably threatening, ‘watchtower’ presence which acts in a malign subliminal way on the consciousness of those unfortunate enough to have had such a structure dumped on their doorstep. It is astonishing that there is still so little awareness of the profound connection between bad design and mental ill health. It is unlikely that the health lobby concerned with mobile phone use would be so strong, were the infrastructure beautifully designed. The crucial importance of good design for a healthy society cannot be overemphasised. Comments: Probably the most visually benign siting of Orange equipment I’ve ever seen, it is screened from most surrounding viewpoints. However, given Orange’s previous record, this is almost certainly accidental! Installations of this sort and the T-mobile installation illustrated on page 20 could form the basis of a ‘street lighting’ system as envisioned on page 6. Amelioration desirable: Paint mast up to height of clubhouse matching brick colour and then above pale grey/green. Comments: Minimal installations in amongst housing soon lost into urban fabric. Some may consider they are too close to housing - less than 50m. Crown Castle Int. site No-; 21m square base tapering galv. steel lattice tower, 3 sector ant. ; 3 tetra ant. ; green and grey cabins; 2m green netting on galv. steel posts; sited against existing 8m hedge, planting to 2 sides with hawthorn, birch and hazel. Orange site No-; 15m three section tapering galv. steel pole; 6 sector ant; 1 dish ant; pale grey equipment cabins; 2m green netting on concrete posts and wood post and wire fence; sited against existing 8m hedge, no planting. Comments: Ugly, intrusive installations adjacent to public recreation area (Broadmeadow Arboretum) and in open countryside. Sited against 8m hedging which provides some screening. Urgent Amelioration Needed: Paint all structures olive green, continue shrub planting around rest of site. Ideal: Demolish masts and replace with wood poles. Crown Castle International site No. 1492004; Vodafone site No. 8827; Hutchinson 3G site No. GL0076; multi-operator site with 28m parallel sided galv. steel lattice mast; 13 sector ant; 5 dish ant; 3 large equipment cabins, 2 pale grey, one olive green; 3m grey netting on galv. steel posts, limited planting. Comments: Tall, ugly lattice mast with large conglomeration of ant., protrudes above tree canopy, intrudes into rolling Gloucestershire countryside and dominates local scene. Large multi-operator site with O2, Orange, Vodafone, broadcast, police and possibly military use. 3 galv. steel lattice masts 17.5m, 23m, 46m; large compound 1/3 acre with 2m netting fence on concrete posts; some existing hedging. 46m tapering then parallel sided steel lattice mast with Vodafone – 6 sector ant; 5 broadcast; 3 Tetra and other ant. Comment: The very worst type of site. 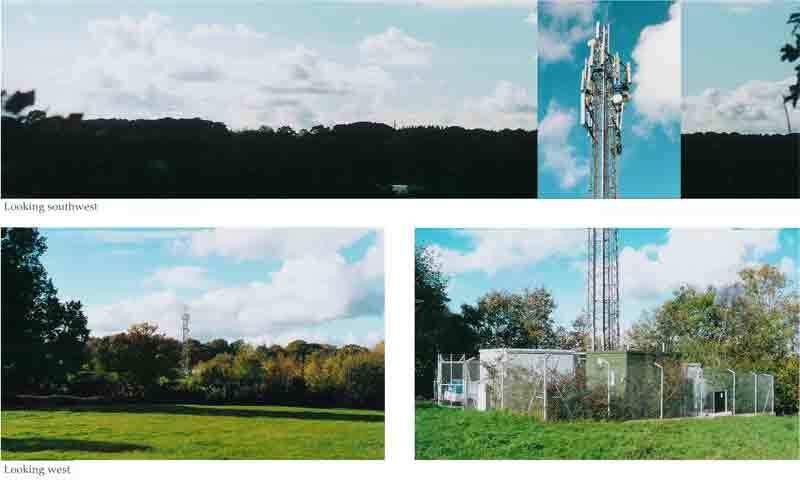 Large highly intrusive multi-mast site dominates surrounding rolling countryside, visible for miles around causing damage to, and urbanising numerous views and vistas. Urgent Amelioration Needed: Demolish the entire site and start again using wooden poles, local trees etc. O2 site No. 9575; 15m, 3 section multi-facet tapering galv. steel monopole; 3 sector ant. pale grey cabins, 1.5m wood post and wire fence; no planting. Comments: Intrusive, shiny mast, very visible in the vicinity. Urgent Amelioration needed: A perfect candidate for use of a wood or wood clad pole stained green/brown (see Bullo) Plant appropriate shrubbery around compound. Orange site No.-; 15m tapering galv. steel lattice mast; 6 sector ant; 2 dish ant; pale grey equipment cabins; 2m grey netting on galv. steel posts; no planting, existing hedging to 2 sides. 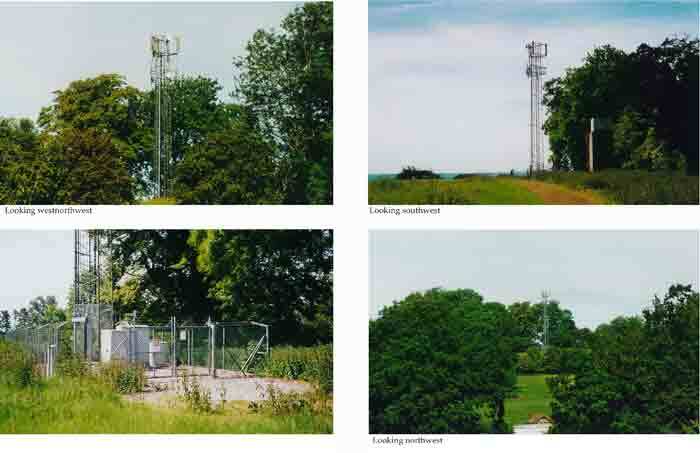 Comments: The usual intrusive standard lattice mast from Orange with its customary lack of respect for landscape, damages good quality open countryside of west Gloucestershire. Visible from local roads and footpaths. 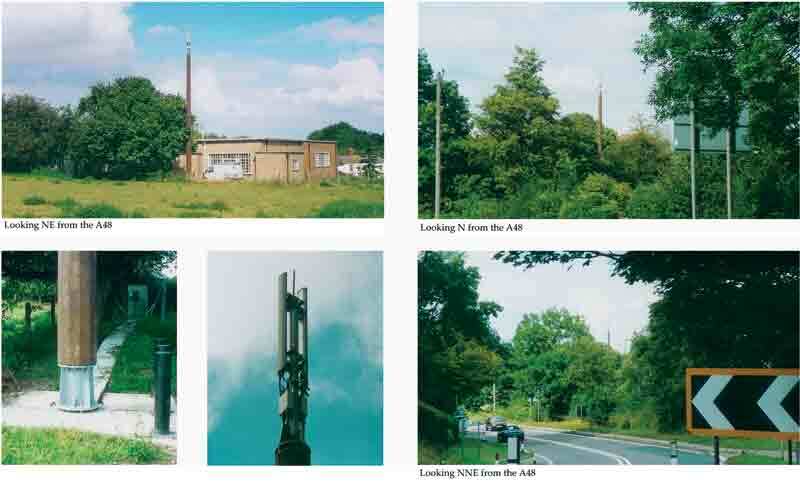 Urgent Amelioration needed: Demolish mast and re-site antennae on wooden pole(s) and/or trees. Minimum paint mast, cabins, netting, posts olive green and plant appropriate shrubs on the other two sides. Comments: Mast sited within a copse leaving only the antennae visible from a distance. They are pale grey which ensures they are visible from a distance. Urgent Amelioration needed: Minimum - paint antennae 12B23. Ideally, attach ant. to trees, or use wood clad pole bringing ant. within the tree canopy. Comments: Both masts sited within a copse, unfortunately the Orange mast is well above the tree canopy and is highly visible from surrounding countryside. The T-mobile mast is just within the tree canopy and is concealed from viewpoints west through north to east. A dull olive green paint would be better than the brown paint. Amelioration needed: Demolish the Orange mast, this is a good site for tree mounted ant. and/or wood pole mounted antennae set against or into the tree canopy. Paint the T-mobile mast, antennae and equipment cabins olive green, plant shrubs around both compounds. Medlock site No- ; 30m galv. steel tapering then parallel lattice mast; 3 co-linear ant. pale grey equipment cabins, 2.5m grey netting on concrete posts. Existing forestry on two sides. Compound within waterworks compound. Comments: Tall highly intrusive mast breaking through canopy of pure forestry, dominates local paths, visible from surrounding view points. Urgent Amelioration needed: Ideally demolish mast and use tree-mounted ant. Minimum -paint mast, cabins etc BS 12B25. Vodafone site No. 4369; 21m galv. steel tapering lattice; 5 sector ant; 2 co-linear ant; 3 TV. relay ant; large grey equipment cabins; 3m green netting fence on galv. steel posts; incidental tree cover on three sides. Comments: Partially concealed mast mitigated by surrounding trees. The view from the west is of bulky grey cabins and tall mast with mish-mash of antennae, close to housing and dominating a public amenity. Visual impact is not the worst but could be greatly reduced. Urgent Amelioration: Paint mast, equipment cabins and fence posts matt BS 12B25. Ideal: Demolish mast and replace with antennae on wooden poles within tree canopy away from housing. Two base stations either side of the A4136 about 100m apart. T-mobile site No. -;15m steel monopole with cylindrical ant. of same radius as the top of the pole; small equipment cabin nearby. All painted pale green. Orange site No. -; 15m galv. steel lattice mast; 6 sector ant; 3 co-linear ant; grey equipment cabin; no planting; aggressive galv. steel fencing. Comments: Interesting comparison between the relatively minimal T-mobile green monopole which blends in well with street lighting and the standard visually aggressive, ugly Orange site, on the skyline from most surrounding view points which makes no concession whatever to the landscape. Whilst both are on the skyline, one is easy to overlook and the other impossible to miss! Mercury site No.- tapering 17.5m galv. steel pole; 3 sector ant; grey equipment cabins; green netting on 2.5m green steel posts; no planting. Amelioration needed: Ideal – demolish mast and re-site antennae in local trees, minimum - paint mast and cabins matt olive green and plant appropriate shrubs around compound. Vodafone site no.0902A; 18m 3 section multi-facet tapering galv. steel pole with 3 sector ant; olive green equipment cabin; 2m. galv. steel palisade fencing; no planting. Comments: One of the more minimal installations (often Vodafone) which becomes lost into the urban fabric. Many would regard it to be too near housing. Improvements: Paint mast and fencing buff stone colour. Plant hedging around compound. Orange site No. – 15m tapering, triangular cross-section galv. steel mast; 3 sector ant; 1 dish ant; grey cabins; green wire mesh fencing on 3m galv. steel posts. Incidental planting to the northwest. Comments: This mast is well camouflaged both by poplar trees, which were planted by the owner of the yard some years before the mast was sited, and by commercial buildings. One suspects this is a happy accident rather than good management. The owner, keen on wildlife, told me of a distinct decline in the number of birds in the immediate vicinity of the yard and mast since it was sited. The poplar screen saves a series of fine rural views looking northeast from the Blakeney to Cinderford road from intrusion by the mast. Amelioration: Paint of an appropriate colour in relation to the poplars on the mast, fencing and cabin would improve the site further. Crown Castle International site No. 164741; Hutchinson 3G. 15m wood clad, 12 facet tapering steel pole; 2 sector antennae; green netting on 2m galv. posts; pale grey equipment cabins; 50% screening of compound by existing vegetation. Comments: A relatively low impact siting for both community and environment. 2 or 3 houses within 100m, telephone exchange mostly unmanned. The wood finish on the mast is a major factor giving it a visual resonance with trees and wooden poles. * The mast is semi-screened by trees from a number of view points. Further Amelioration: Cylindrical GRP casing the same diameter as the top of the pole placed around the antennae and painted mid brown to match the pole would give a more acceptable and streamlined finish. Reduce the height of the mast so that it is within the tree canopy. Paint equipment cabins and fencing posts matt olive green BS 12B25. Grow ivy up walls of ugly telephone exchange. *These poles carry electricity and telephone lines – ideally the lines should be placed underground. 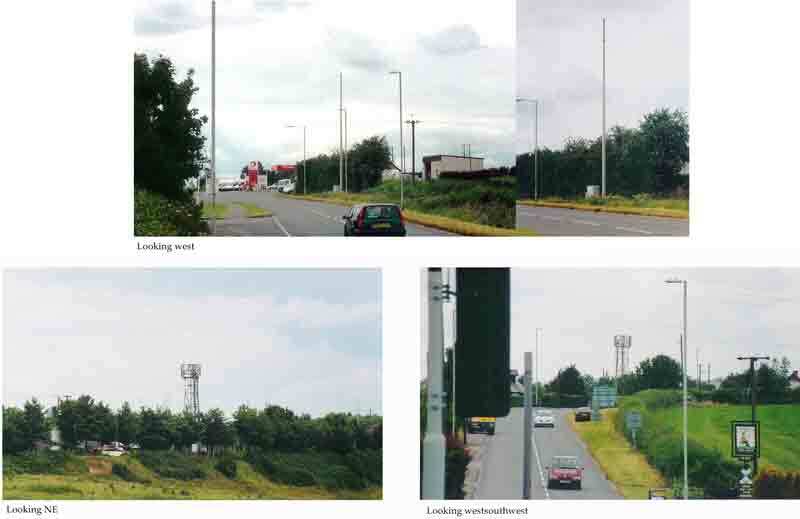 Comments: The very worst type of site - ugly, highly intrusive mast, dominates surrounding open countryside, highly visible from miles around, from the A48 and other side roads. 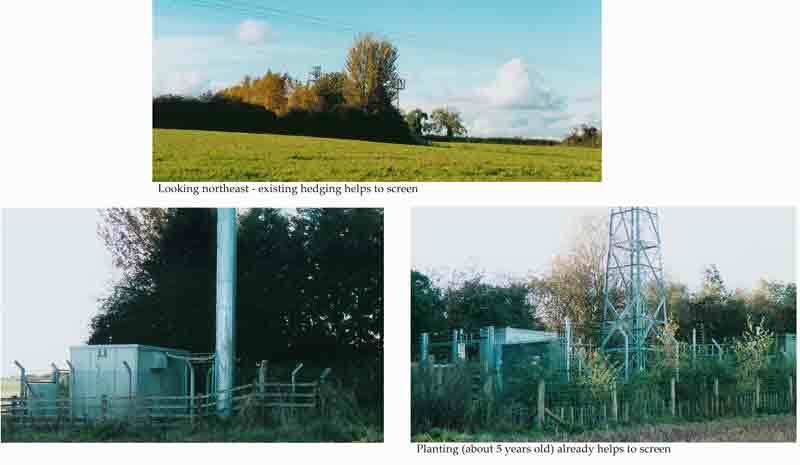 Urgent Action needed: Demolish mast and replace with 2 or more lower, single wood pole masts which should then be screened with planting to surround using 3-5m saplings. O2 site No. 3948; 18m three section tapering galv. monopole; 2 sector ant; 1 dish; pale grey equipment cabin; 2m grey fencing on concrete posts; no planting. Comments: Although on a high site visible from Longhope, this is a relatively benign siting. The mast is concealed from many other view points, however it does intrude on local footpaths. Amelioration: Paint mast, cabins, fencing matt BS 12B25. Ideally, replace mast with wood pole. Orange site No.-; 22m 5 section galv. steel pole; 3 sector ant; 2 pale grey equipment cabins; green netting on green steel posts; no planting. Comments: Large compound (why so large?) in mature woodland close to footpath and main road. 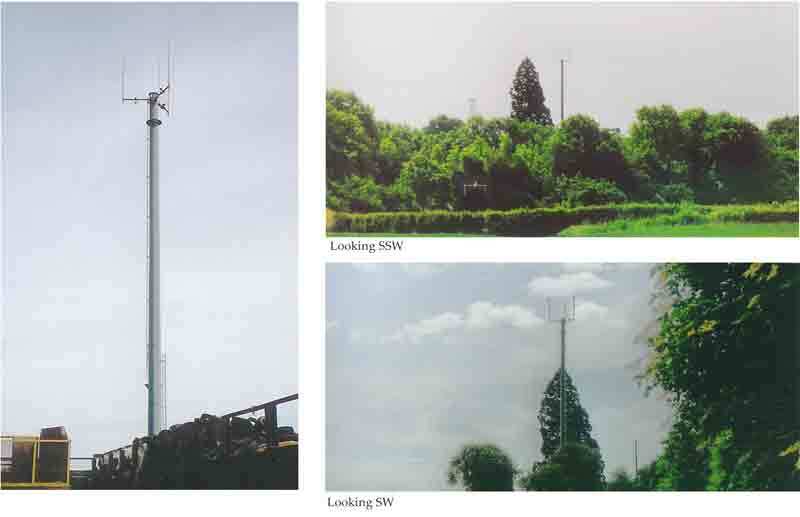 Mast is surrounded by trees with only the antennae, very visible from the A40 and surrounding land, proud of the tree canopy. Amelioration needed: Paint mast, cabins matt BS 12B25. Ideally use wood clad steel pole and reduce height so that ant. are within tree canopy. Plant shrubbery around compound. Crown Castle Int. site No.-; 22.5m square cross-section, glav. steel lattice mast; One2One Cell ID 92237, 6 sector ant. ; 2 dish ant. ; grey netting on galv. 2m posts; pale grey equipment cabins; no planting. Comment: Tall mast on high ground, dominating the canopy of mature trees intruding into quality rural views from the A48 and local footpaths. Partial tree backdrop helps significantly. 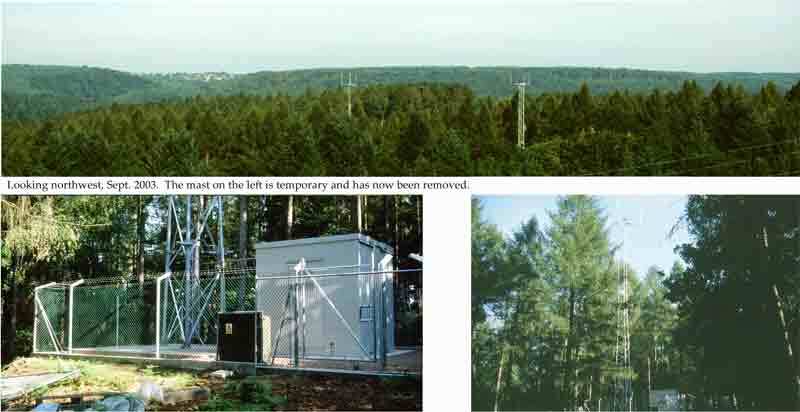 Ideal: Demolish mast and re-attach antennae to mature trees and / or use wood poles not higher than the tree canopy. Crown Castle site No. - ; Operator: Mercury. 15m steel lattice mast; 6 sector antennae; 3 dish ant. ; green netting on 3m galv. posts; pale grey equipment cabins; planting to the SW, NW sides of compound – why not NE, SE too?! Comments: Ugly mast sited in open countryside close to a few houses and work places. Intrudes into important wooded rural views and vistas from local footpaths and the A48. Urgent Amelioration Needed: Paint mast, antennae and cabins olive green; plant around the NE, SE side of compound. 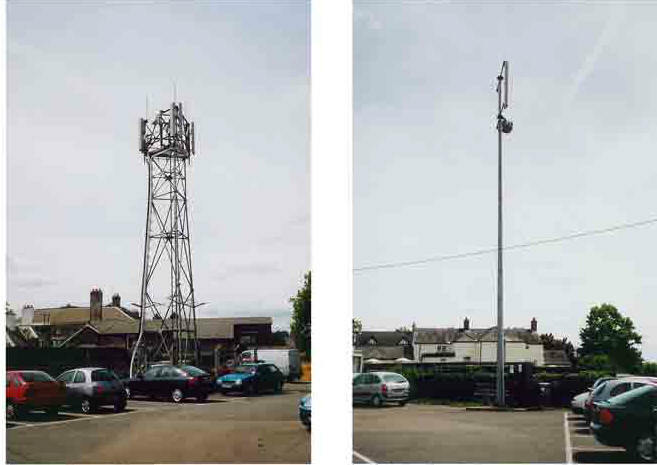 Ideal: Demolish existing site and mount antennae on existing trees 500m to north of present site; and / or use 2 – 4 No. wood or wood clad poles placed up against the fringe of the nearby wood. Orange site No. -; 15m galv. tapering, square cross-section steel lattice mast, 4 sector ant. ; 2 dish ant. ; 2 grey equipment cabins; green mesh fencing on green steel posts. 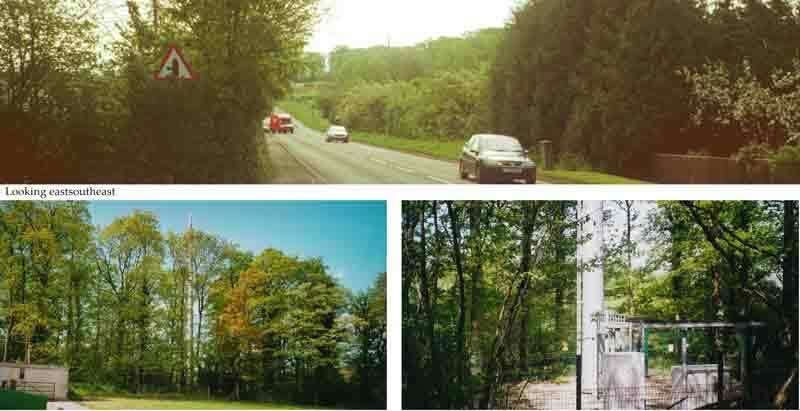 Comments: Ugly, intrusive mast in rural setting benefits from tree backdrop and high hedge beside the road. Relatively well hidden. Urgent amelioration needed: minimum - paint mast and antennae matt olive green. Plant hedging around other three sides of compound. Ideal: Demolish lattice mast and replace with wooden poles below the height of the trees. Vodafone site no.4257; 15m (18m?) 3 section galv. multi-facet pole; green cabins; no compound. Comments: Both masts are quite well concealed behind the garage and by the urban fabric when seen from surrounding viewpoints, but are close to housing and businesses. ntl multi-operator site No. -; Operators: Vodafone site no. 6518; One 2 One Cell ID 92001; 28m galv. lattice mast, 7 sector ant. ; 2 dish ant. ; broadcast array, some green cabins, some grey; wooden post and wire fencing. Comments: This mast should not have been allowed in its present form as it compromises a number of important views in the AONB. Any future developments should seek to REMOVE present impacts. This is a controversial siting in ancient woodland in top quality Wye Valley AONB landscape with Grade 1 listed architectural heritage building – Tintern Abbey in the near vicinity. 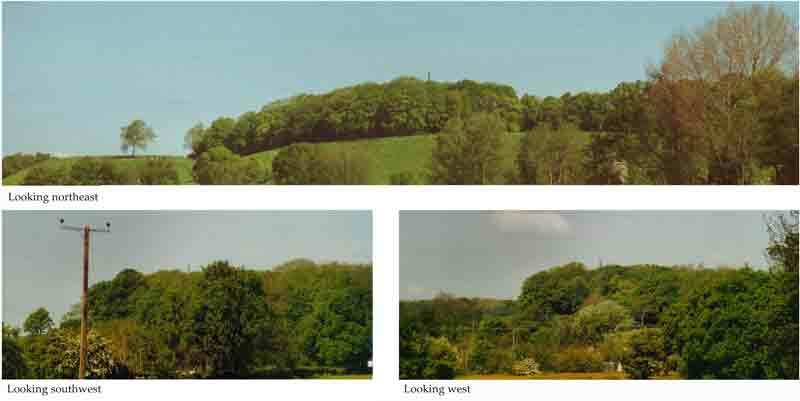 Although the mast is invisible from the immediate environs of the Abbey, and only the tip of the mast is visible from the A466 in Tintern village, the upper 10 metres is increasingly visible proceeding up the valley past Tintern Parva. It is also very visible looking downstream from Brockweir Bridge and visible from higher points on the west side of the valley. 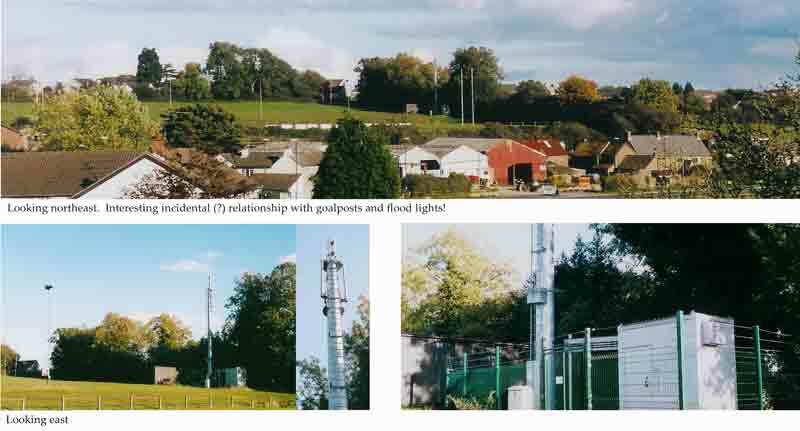 URGENT AMELIORATION NEEDED: Demolish mast and re-site antennae by attachment to trees –see Crieff solution. 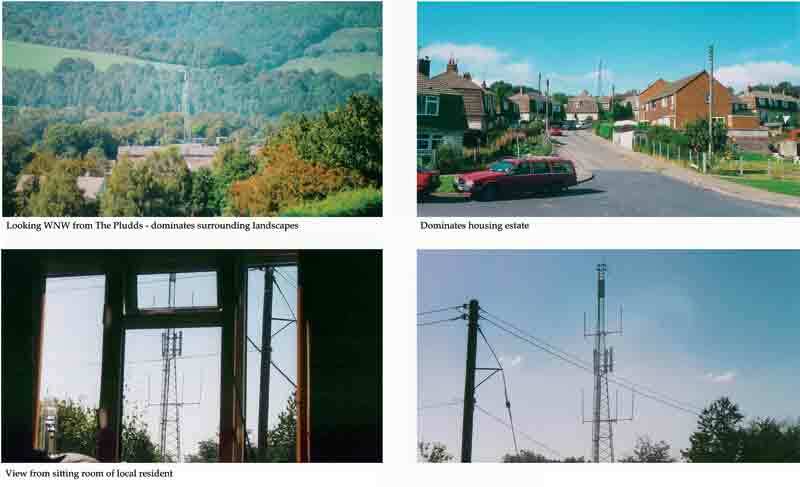 Views and vistas in and around AONBs should not be compromised by telecoms infrastructure. 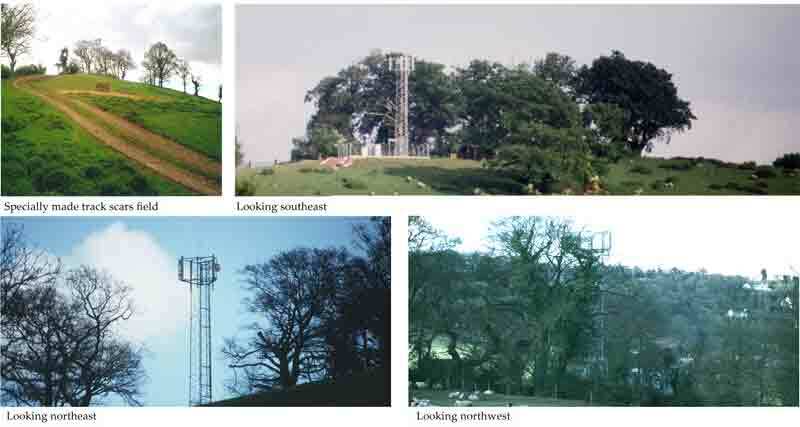 Comments: Tall, intrusive, multi-operator lattice mast on high ground close to the boundary of, and visible from within, the Wye Valley AONB. Urgent Amelioration needed: This mast should be demolished and replaced with 2 or 3 wood/wood finished poles placed within the tree canopy. Multi-operator site; Ref. WIC Littledean; BT site Ref. WA13; 02 site ID N. GL025; 28m tapering square section galv. steel mast; tetra ant; 1 omni ant. 4 emergency services ant; 1 green equipment cabin; 1 brick rendered and tiled cabin; 2m netting on galv. steel posts; no planting. Comments: Tall mast in commanding position on high summit – damages views and vistas for miles around. Steelwork and ant. relatively slim so is more likely to ‘disappear’ with distance. Urgent amelioration needed: Demolish mast and site ant. on trees in nearby woodland. Minimum reduce height of mast and paint pale grey/blue, plant shrubs and trees around compound. Comments: Ugly watchtower design (see Driffield Road) close to housing. Merges into the urban fabric. Amelioration: Redesign mast and site away from housing. 2 section multi-facet 18m galvanised steel tapering pole with 3 colinear ant. Comments: Moderately intrusive into surrounding rural landscapes, dominates farm buildings. Visible from local footpaths, the A48 and the railway. Amelioration: Paint mast and equipment cabin matt olive green BS 12B25, plant shrubs and small trees around compound. 15m Tetra galv. steel pole mast; three omni-directional antennae; 2m galv. fencing on galv. steel posts 2 pale grey equipment cabins; existing shrubbery on two sides. Comments: Unpainted intrusive mast in Wye Valley AONB. Relatively well sited in that it is only visible in the immediate vicinity, however it is very intrusive for one local resident who has been to court to have it removed. This action failed but he is now seeking compensation for loss of value on his property. Urgent Amelioration Needed: Demolish mast and attach antennae to tree(s). Minimum – paint mast and cabins olive green, plant appropriate shrubs around compound. Comments: Highly intrusive into local and longer views. Intrudes into mature woodland and footpath. Surrounded by mature larch with long boles – a perfect site to use a wood clad steel pole. Urgent Amelioration Needed: Demolish lattice and use appropriately stained wood clad steel pole to match larches. Reduce the height. Minumum – paint mast, cabin, fencing and posts matt BS 12B23 and plant appropriate shrubbery around compound. ntl broadcast site, 15m parallel sided triangular cross-section lattice with mid grey paint. Green equipment cabin and post and wire fence. Urgent Amelioration Needed: As an interim measure until demolition, mast should be painted matt finish BS 12B25. ntl site No.11055; 15m parallel sided, triangular cross-section galv.steel lattice mast; TV relay ant; grey equipment cabin; 3m aggressive galv. steel fence; no planting. Amelioration: Paint mast, cabin and fence matt BS 12B25; plant around compound. 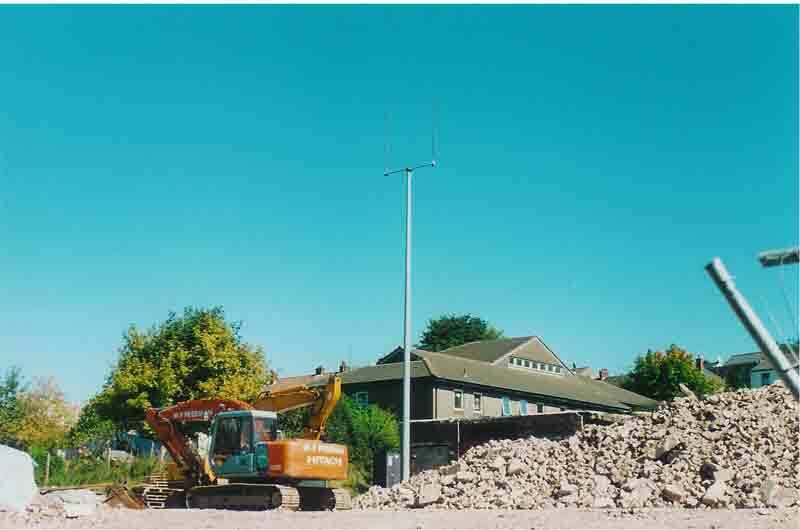 Ideal: Demolish and replace with wooden or wood finish pole mast sited up against tree line. 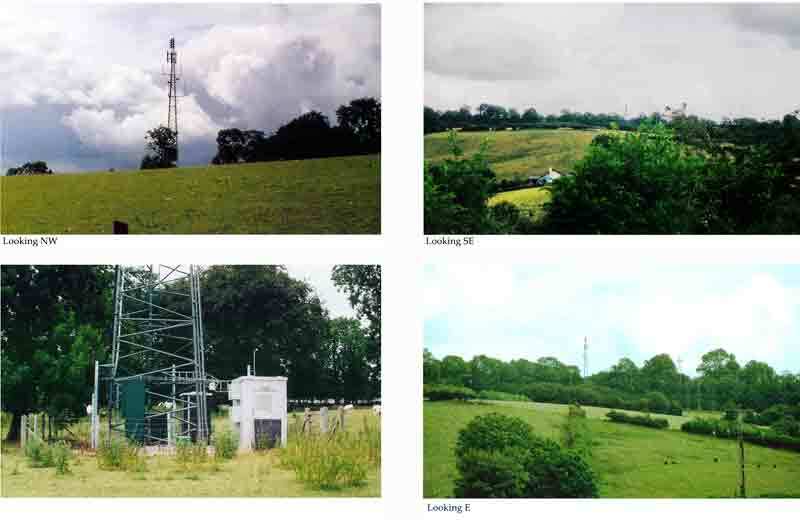 ntl site No.- 18m parallel sided, triangular cross-section galv.steel lattice mast painted dull grey; TV relay ant; olive green equipment cabin; wood post and sheep wire fence; no planting but incidental tree backdrop. Comments: Older slim painted lattice is less intrusive than many. Appropriate fencing much used in the area by farmers. The importance of a backdrop of trees is again demonstrated. Amelioration: Paint mast matt olive green BS 12B25 rather than dull grey, plant around compound. ntl site No. -; 15m parallel sided, triangular cross-section lattice mast, cabin, wood fencing. No information at the compound; 21m triangular cross-section, tapering galv. steel lattice mast, 4 television relay ant; dark green equipment cabin with white roof(! ); wood post and sheep wire fencing. Comments: Intrusive steel lattice mast just inside woodland and beside footpaths. Mast is surrounded and predominately screened by oak and spruce. The design of the antennae has an intriguing incidental sympathy with the shape of the spruce foliage. Amelioration: Paint mast and antennae olive green.